NOTICE: OUR OFFICES OUR PERMANENTLY CLOSED. WE NO LONGER OFFER AESTHETIC SERVICES TO THE PUBLIC. OUR PROFESSIONAL ACTIVITIES IN THE AESTHETIC FIELD ARE LIMITED TO PHYSICIAN AND PROVIDER TRAINING, RESEARCH AND PRODUCT DEVELOPMENT. FOR INQUIRIES ABOUT TRAINING REACH US TO THE CONTACT BELOW. Life is about smiling and being happy. However, sometimes when we laugh, smile or frown we use muscles in the face that are creased or contracted into folds of skin that form movement wrinkles more commonly known as dynamic wrinkles. The well-known dynamic wrinkles are "crows feet", frown or "worry lines" in the forehead and between the eyebrows. The creasing and contracting of the muscle over time causes deep and permanent wrinkles. Even one treatment of Botox at the Houston Botox Clinic will relax facial expression lines leaving you looking younger and more refreshed. If your dynamic wrinkles make you look older than you are, there is now a way to erase these lines without surgery, scars and recovery time. Botox is the brand name for a form of botulinum toxin Type A, which is produced by the bacteria, Clostridium botulinum. Houston Botox is an injection of minute doses into certain facial muscles to stop the muscle contractions, which cause lines and wrinkles. 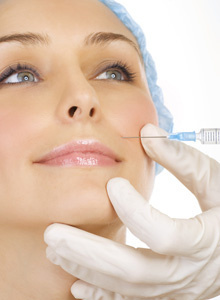 Botox is injected using a disposable syringe with a very fine needle. A very small amount of the Botox powder is diluted with saline and injected very precisely into several locations on the face. The pain associated with the injections is minimal. Many patients describe it as a bug bite sting for only a couple seconds. No local anaesthetic is needed and you can resume normal activities immediately. Treatment takes around 15 minutes, depending on the number of areas you wish to treat. Once you have been treated at Houston Botox Clinic it usually takes two to five days before Botox actually takes effect and sometimes even a little longer to notice the full effect. Houston Botox is commonly used on the forehead where we often get crease lines, it can also be used on the crows feet around the eyes that usually come from smiling, on the frown lines in between the eyebrows, and if so desired, on the bunny lines of the nose. Botox may last for 3 months but will eventually wear off. This allows the patient to test it to see if they like it and wish to continue with the treatment upon the need for renewal. Botox is a widely known and highly used procedure. It is safe. Botox has been used around the world for over a period of ten years; it was first used to treat perspiration problems in individuals. The patient may experience temporary tenderness or bruising where injected. This does not always occur. And if it does, it disappears in a day or two. There is a possible side effect of the Houston Botox, which may cause a temporary weakness in muscles close to the treated muscles. Though it is very rare it can cause drooping of an eyelid or eyebrow, which also disappears in a week or so and can be treated by eye drops to reverse the side effect. Your doctor will examine you to see if you might be prone to any of these side effects and warn you before treating you. Before and After Crow's Feet Botox Treatment. 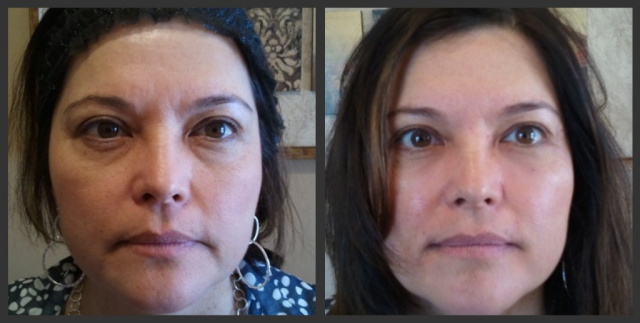 Before and after pictures of Frown Line Botox Treatment. Botox-facial Fillers Case Studies. Botox Houston Clinic. 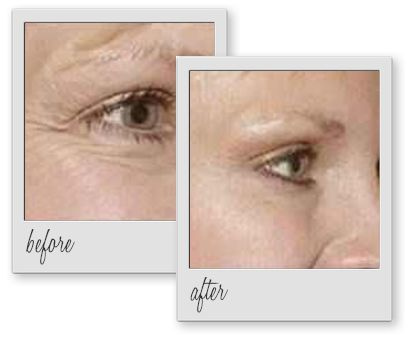 For before and after pictures of our own patients please click to visit Houston Botox before and after. Improve mouth symmetry (our doctors specialize in facial sculpting effects). Decreased "marionette's lines" (also call puppet's lines). Softening of the lower eyelids and under the eyes markings, lines and tear drops (reduction of the "tired look" common after 35-40 years of age, even when you are not tired). Decrease crows feet and frown lines with Botox.